The Karbonn A40 Indian recently shot into the spotlight as Airtel’s new initiative to take on Reliance Jio’s ‘effectively free’ Jio Phone. The main difference between the two is that Airtel boasts of providing an Android smartphone for an effective price of Rs. 1,349 (versus the ‘smart’ feature phones provided by Reliance and BSNL), provided you abide by Airtel’s recharge policy in order to get the cashbacks. 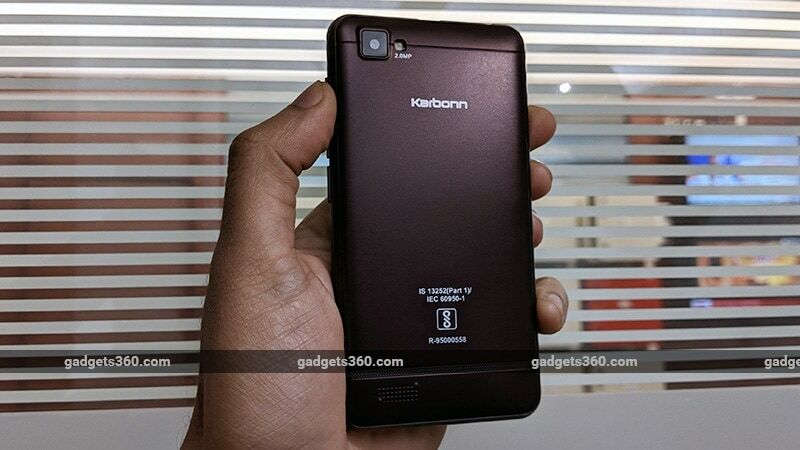 The main highlights of the Karbonn A40 Indian are of course its low market price of Rs. 3,499 and the fact that it supports 22 Indian languages. With modest specifications under the hood, let’s see what sort of an Android experience awaits you at this price. The plastic body of the A40 Indian feels sturdy, and the ‘Coffee Brown’ colour doesn’t attract fingerprints. This is a chunky little phone at 10.5mm in thickness, but it didn’t really bother us too much due to its small footprint. There are rounded edges and sides which make it easy to grip. The sides and back cover are all one piece, so the entire frame needs to be opened up in order to access the SIM slots and battery. The front facia has thick black borders around the screen, with thicker borders at the top and bottom. The screen smudges easily and is a pain to keep clean. The A40 Indian features a 4-inch capacitive display with a resolution of 480x800. The pixel density is a low 233ppi so images and text aren’t the sharpest. However, this isn’t that big an issue compared to viewing angles, which are very narrow, especially the vertical viewing angles. Tilt the phone forwards a bit and the colours immediately begin inverting, whereas when you tilt the phone back, the colours wash out badly. When viewed normally, the colours appear a bit dull but brightness is decent. There’s no ambient light sensor, so you’ll have to adjust the brightness manually all the time. There’s no notification LED either. There are non-backlit capacitive buttons below the screen, while the volume and power buttons are placed on the right. There's a 3.5mm headphone socket and a Micro-USB port on the top. We didn’t like the fact that USB port is a bit recessed into the body, which means you can use only the bundled cable which has a slightly longer connector. Standard Micro-USB cables often don’t work, which might limit the options in case users need to buy a replacement later. Taking off the back cover reveals the slots for two SIMs and a dedicated microSD card slot. Both SIM slots accept the older Mini-SIM-sized cards. The A40 supports microSD cards of up to only 32GB. 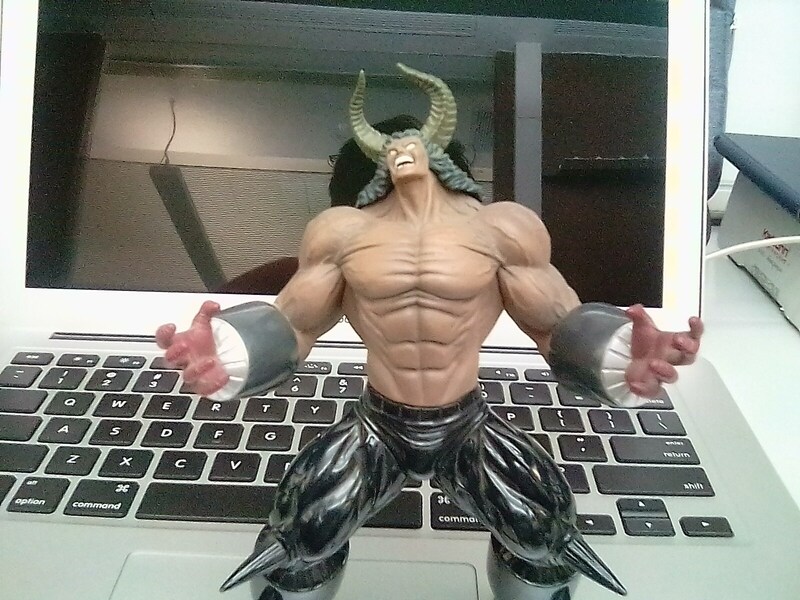 The battery is also removable. In the box, Karbonn offers a charger, power adapter (2.5W), screen guard, headset, user manual, and a warranty card. The quality of the accessories, especially the headset, is quite average. The A40 Indian is powered by a quad-core Spreadtrum SoC (SC9832A) and has 1GB of RAM and 8GB of onboard storage. The A40 Indian supports 4G VoLTE as well as Bluetooth, Wi-Fi b/g/n, and FM radio. However, USB-OTG isn’t supported and neither is GPS. You get only an accelerometer and proximity sensor, nothing more in terms of sensors. Benchmark scores were below average as expected. AnTuTu returned a score of 23,220 points while 3DMark Ice Storm scored 3,753 points. Even though the Karbonn A40 Indian is now part of Airtel's initiative, it isn't locked to the Airtel network, and were able to use a Jio SIM with it. The phone runs on Android 7.0 Nougat, which is left pretty close to the stock look and feel. Since this phone was launched as a special Airtel initiative, there are a host of Airtel apps such as Games, TV, Wynk Music and the My Airtel app. There are also other preloaded apps, including trial versions of Bubble Bash 3 and Motocross: Trial Extreme, Xender, Saavn, Game Zone, Flipkart, and Dailyhunt. All these apps can thankfully be uninstalled. The Karbonn Fun Zone app lets you download games and shows you news in Hindi. The A40 Indian also has the Google Play Store, so you can download common Android apps such as WhatsApp, etc. General performance isn’t the smoothest and that’s something you need to keep in mind. On average, there’s about 251MB of free RAM for launching apps, which isn’t much, so loading times are understandbly longer than usual. Even with stock Android, you always have to wait a second or two before things happen, whether it is opening the Settings or Google’s Now on Tap. Swiping right on the home screen takes you to feed page called Minus Infinity, which has widgets for AccuWeather, suggested apps, and news, but this can't be customised. The lack of GPS can be a problem at times when you’re outdoors as the phone can only use Wi-Fi, Bluetooth and network towers to find your position. Typing on the A40 Indian is also quite painful as the keys on the virtual keyboard feel too tiny on this screen. Web browsing on Chrome is a bit sluggish, although websites optimised for mobile load quickly and scrolling isn't too bad. Popular apps like WhatsApp run well too, however, there is a bit of lag while opening media or scrolling through chats, which is to be expected. Touch response is not great either, and since the display panel isn't laminated to the glass, it feels a bit disconnected when you’re interacting with the screen. The display also smudges easily and can be quite reflective under artificial lighting. Sunlight legibility is also quite weak. The phone can handle 1080p video playback, but due to the poor viewing angles, it’s not a very pleasant experience. The speaker gets fairly loud but the sound is a bit tinny for media files. Casual games such as Where’s My Water run decently well, but don’t expect to run heavier titles. Onboard storage isn’t much but thankfully, you can format a microSD card as part of the internal storage. The cameras on the A40 Indian are merely there as placeholders, as image quality is quite disappointing and often unusable, even for social posting. The rear 2-megapixel sensor has an Auto mode but there doesn’t appear to be any actual autofocus present. Tapping the screen gives you a focus reticle but doesn’t actually make the camera focus. The live viewfinder is also quite laggy and preview quality is sub-par. The camera app is quite feature rich for a phone of this calibre, with plenty of shooting modes such as Burst, Manual, Panorama, GIF, Frame and Qr Code. It's a different story that the results from these modes are often not worth the effort, but we have to hand it to Karbonn for adding them. 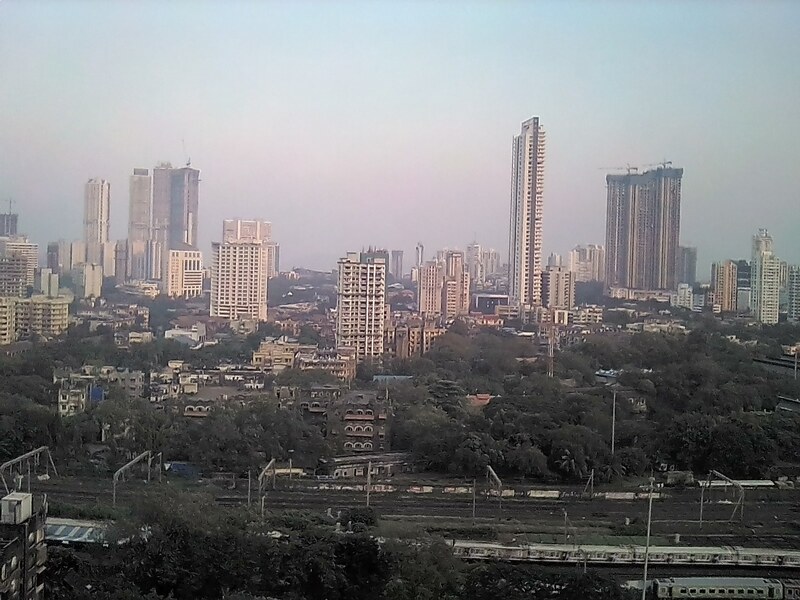 In daylight, landscape shots have horrible artefacting and muted colours, while macros lack any sort of focus. Low-light shots are often unusable. The front camera sensor has only a 0.3-megapixel resolution and as expected, the quality is pretty poor even under good lighting. Video recording for the rear camera maxes out at 720p but once again, the quality is sub-standard. The Karbonn A40 Indian has a small 1400mAh battery, which lasted for 3 hours and 54 minutes in our HD video loop test. With regular usage, we had to charge the phone well before the day was up, sometimes even within half a day if we played a lot of games. Charging was also painfully slow. 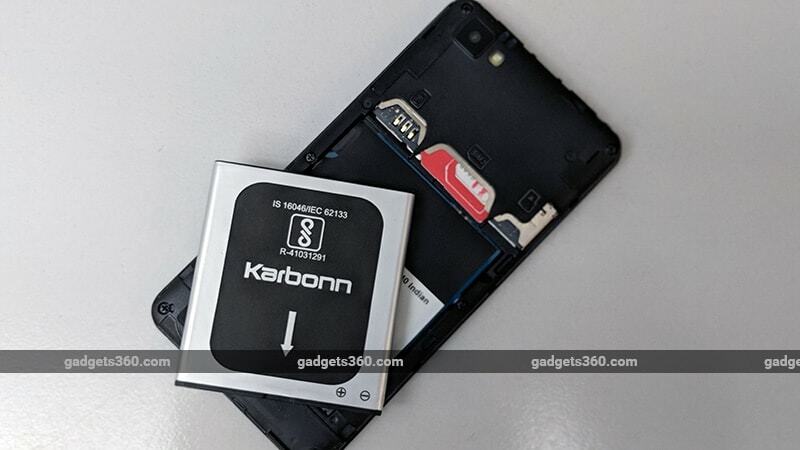 You could consider the Karbonn A40 Indian as a smartphone for calls and basic usage like WhatsApp and messaging, but don’t expect a good experience in any other areas. If you diligently follow Airtel’s rules for recharging your prepaid account, you could maximise the value of this offer. Apart from the A40 Indian, the Karboon A41 Power and the A1 Indian are also eligible with this scheme. They are all priced around the same amount and feature similar specifications, so we doubt the experience would be any better (or worse) than with the A40 Indian. Compared to the Jio Phone and BSNL’s Bharat-1 (First Impressions) feature phones, the A40 Indian offers access to most of the popular Android apps for a bit more money, but at the cost of battery life and camera performance.